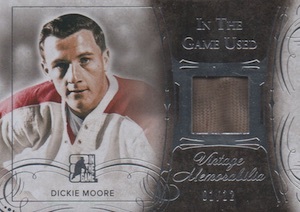 Continuing the relic-heavy set from ITG, 2015 Leaf In The Game Used Hockey returns with a large mix of memorabilia card options. 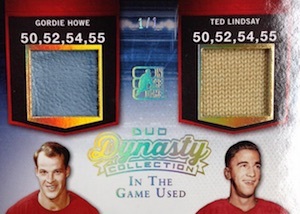 Each box promises five game-used jersey cards. 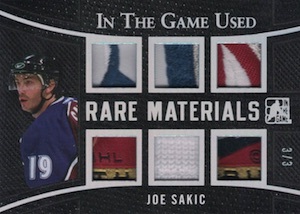 Focusing on a plethora of relic inserts, there is no true base set in 2015 Leaf In The Game Used Hockey. 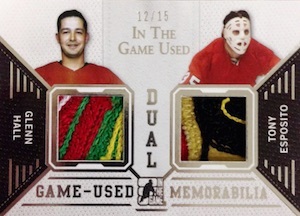 However, single-player relic sets include Game Used Jerseys and Patches, Dynasty Collection Memorabilia, Locker Room Collection Memorabilia, Maximum Memorabilia, Rare Materials Memorabilia, Stack the Pads Memorabilia and Vintage Memorabilia. 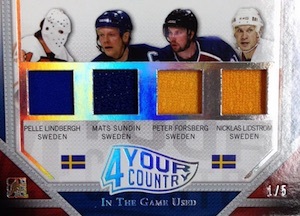 There are also quite a few multi-player combos in the release, including 4 Your Country Memorabilia, Dual Game Used Jerseys and Patches, Dynasty Duo Memorabilia, Fantasy Team 8s Memorabilia, Game Used Jersey Quad, Game Used Jersey Trios, Game Used Patch Quad, Game Used Patch Trios, Hat Trick Memorabilia, Team 8s Memorabilia. Vintage collectors are also in luck thanks to various multi-player options. 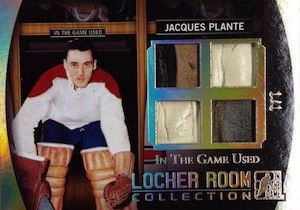 Vintage 2 Memorabilia, Vintage 3 Memorabilia, Vintage Four Memorabilia, Vintage Six Memorabilia and Vintage Eight Memorabilia all feature game-used gear for multiple former greats on one card. 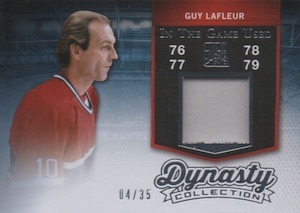 Finally, while rare, there is one main autographed memorabilia set in 2015 Leaf In The Game Used Hockey. 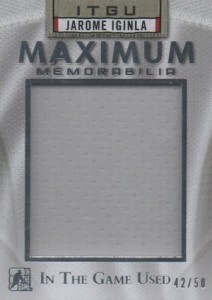 In The Game Used Autographs combine a signature and game-used relic. 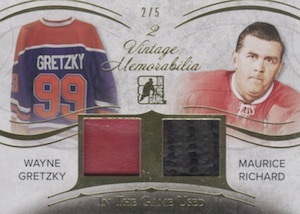 Maurice Richard, the first man to score 50 goals in 50 games, is featured in a special insert. The 50 in 50 Cut Signatures card honors the 70th anniversary of his impressive achievement. 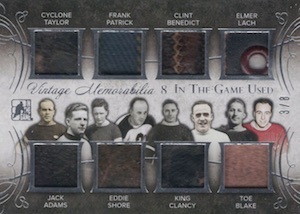 All memorabilia cards are enhanced by several parallel tiers, all of which are numbered. Silver Foil, Gold Foil, Silver Prismatic Foil and Gold Prismatic Foil parallels are available for most of the cards with varying rarity. This collector gives them a 4 only because he cannot afford any of them. 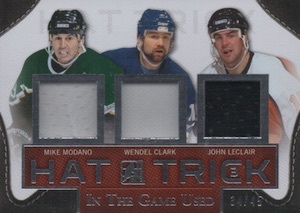 Let’s see… 5 hockey cards or my cable-phone-internet bill for a month? Isn’t it a bit premature to be putting a piece of Connor McDavid’s Erie Otter Jersey on a card with Ovi, Stamkos, and Crosby ? Might make a little sense to put him on a card with Burakovsky, right? Both Otters. Maybe dig up some GU Andre B. Otter Jersey’s and/or my Caps ? Hello. I guess I get it. 15 McDavid cards. Is there an Jack Eichel in the house? No sir. So, they have “signed” Mr. McDavid, right? Is that how this works? 5 Ovechkin cards and 5 Busher Jackson, as well. I think it’s actually pretty cool that I have never heard of Busher. Makes me wonder if somebody has a collection of Busher Jackson cards out there somewhere? 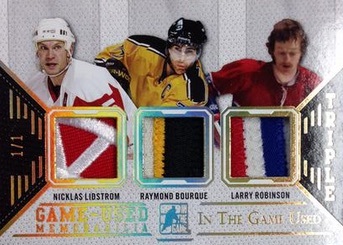 I do have my eye on a specific /60 though – I am talking to you Fedorov/Jagr! Basically, the set is “off the chain” high end! Best product of all time. Seriously. What product can you open and consistently get more value than you paid for out of it? None. None. None other than 2015 Leaf ITG Used! My LCS isnt carrying Leaf ITG anymore. Nobody buys it. Seems to be the favorite of about 7 people in North America. easily the best Hockey product of the year! incredible vintage memorabilia. 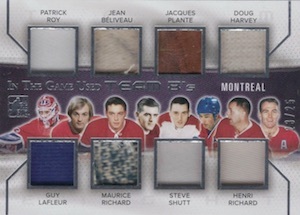 I pulled an Edmonton 8 swatch piece that is unreal! It boggles my mind who buys this expensive crapola from Leaf. It’s simply a very poor investment to make compared to other products at the same price point on the market. If you truly feel as though it is a solid investment – I beg you to have a gander at what the cards from this set are selling for on the internet marketplace. So far…4.5/5 for this? You have to be kidding me.